I promised you a post about tools. We carry a lot of tools, ranging from your basic standard pliers through jigs, winders and miscellaneous twisty things all the way up to devices that would look more at home in a mediaeval torture-chamber. So far, though, we don't sell all that many of them, probably because most of our customers are already into making jewellery and if they are anything like us already have more tools than they actually need! Plus, if you see all these things all at once, it is a little bit daunting. So here's a quick run-through of some of things we have. We're hoping to follow up with some more detailed posts on what these are and how to use them - Paul has volunteered to act as guinea-pig for this, as if he can work how to use them it must be easy for anyone. 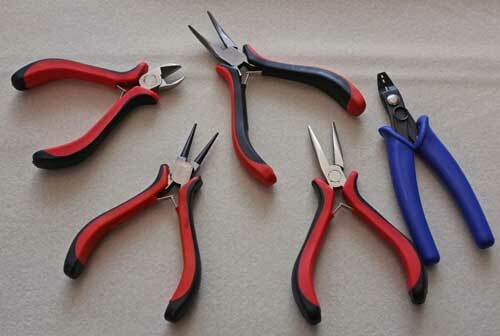 This would be roughly your basic toolkit - a range of plier-shaped things, most of which are actually pliers. 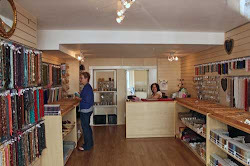 We carry several ranges of these, from basic to smart colour-co-ordinated toolkits. The ones in the picture are the cheapest imports that we have, and they perform surprisingly well. At the top left are some side-cutters for chopping bits of wire up and cutting stranded wire (don't use these for memory wire though, they'll go blunt very quickly). These are amazingly popular: all but one of our current stock has either been sold or stolen by our tame local shoplifters. That's kind of annoying for Paul who wants to buy one, and Ann won't let him as customers take priority. Luckily there's a bunch more coming next shipment. Bottom left is a set of tapered round-nosed pliers for making loops in wire, which is what you need to do for hanging stuff off other stuff. There's a bit of a knack to using them but it isn't as hard as it first looks. Grab a bit of wire and play around with it for a while and you will get the hang of it - certainly beats watching a 20-minute video on Youtube. The other two red-handled ones are ordinary jewellery pliers. Like household pliers but with narrow jaws and used for squashing things, holding things and bending things. Also handy for picking up small things you have dropped if you have recently cut your fingernails. If you're doing much work with wire you'll probably want two of these (one straight-nosed and one bent-nosed) so there's one for each hand. And the blue ones at the right are crimping pliers used for squashing crimp beads on to wire or thread to hold other things in place. It is possible to use ordinary household or jewellery pliers for this, though your squashed crimp bead will look flat rather than round, and there's definitely a bit of practise needed to get the technique right. We can always show you to do this in the shop if you aren't sure. This beast of a tool turned up a few days ago. 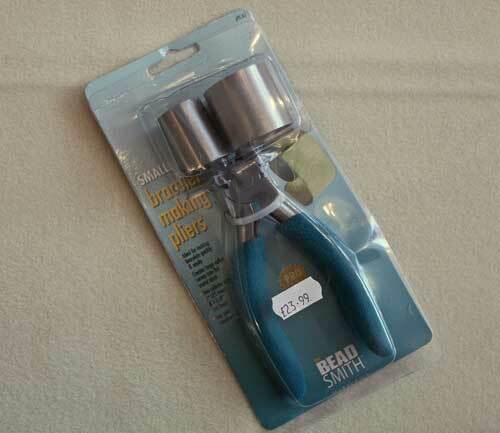 It is like a monster version of asymmetrical bailing pliers (and no, I haven't yet worked out what bailing pliers do or why they are asymmetrical or we have so many in stock in different sizes). Will have to come back to you on that one. It claims to be a bracelet-making plier, though it looks like it would be spectacularly effective for crushing somebody's knuckles. Don't try this at home. When we have worked out what it does we will tell you. 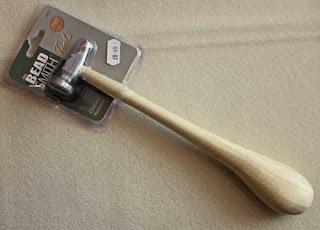 And this beautifully shaped and weighted object is a chasing hammer. Traditionally it is used for fine-grained punch-work on metal, but for us it is for flattening and shaping wire. Should also be good for juggling with if you have three of them, but again I wouldn't suggest trying this at home, not if there is anything fragile in the room like your head for example.